The application is specially designed to track the location of the stolen phone, especially when the phone is off. My mom cooked a lot of dishes specially for me, but the sweet dish was especially delicious. So, you might have noticed that these two adverbs are used at different positions in the given cases. In the two cases specially indicates ‘specifically’, whereas especially refers to ‘particularly or before all else’. Meaning The word 'specially' is used to mean for a particular purpose. We use 'especially', when we single out someone or something over the rest. Describes Something with distinct objective. Something exceptional. Usage When there is a past participle. Before prepositions and conjunctions. Examples The smartphone is specially designed for software professionals. I love flowers, especially roses. Kate wore a specially designed dress at the party. This place is very hot, especially in summers. I bought bananas specially for you. The Principal scolded all the students especially Harry. She came to London specially to see Buckingham Palace. You can borrow my laptop for your exams, and you don’t need to buy one specially. The body lotion is specially manufactured for those with rashes on their skin. The Cheif guest was treated specially, at the annual function. The guests liked all the dishes, specially the main course. This is a specially beautiful necklace. We are not especially interested in watching movies. She was especially fond of collecting stamps. I bought this diamond necklace, especially to gift my mom on her wedding anniversary. White tigers are found especially in India. Joe wrote a novel, especially to express the love for his wife. Heart patients are especially prone to this disease. The CEO especially loved the idea of developing a motorbike for teenagers only. Specially, is the adverb form of the adjective special, which is used to indicate ‘for a special purpose’. Conversely, the adverb ‘especially’ is used to highlight the importance of something or the superiority of someone, over others. It may also mean very or particularly. 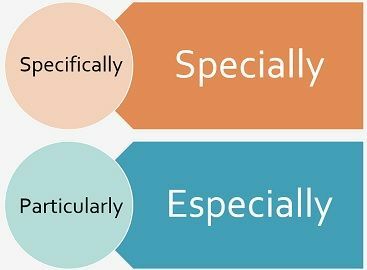 The word ‘specially’ has only three syllables, whereas there are four syllables in the word ‘especially’. When something is created with a specific objective or reason, we use the word specially. As against, especially denotes something exceptional or above all, i.e. when you want to lay stress on what you state is more appropriate to a particular person or thing than the rest. Specially used in a sentence when there is a past participle. On the other hand, especially is placed prior to preposition or conjunction in a sentence. The new train was specially designed for the persons with disability. These medicines are specially made to cure dengue. What was specially interesting about that place? He remembers all the dates, especially birth and death anniversaries of celebrities. It is especially important to reach on time, on the first day of your office. You should book the tickets in advance, especially if you want to avoid last minute hustle. You can easily know the difference between specially and especially by understanding their meaning. When something is created or done to serve a different and particular purpose, you use special, whereas when you want to single out someone or something over the rest, you use especially.